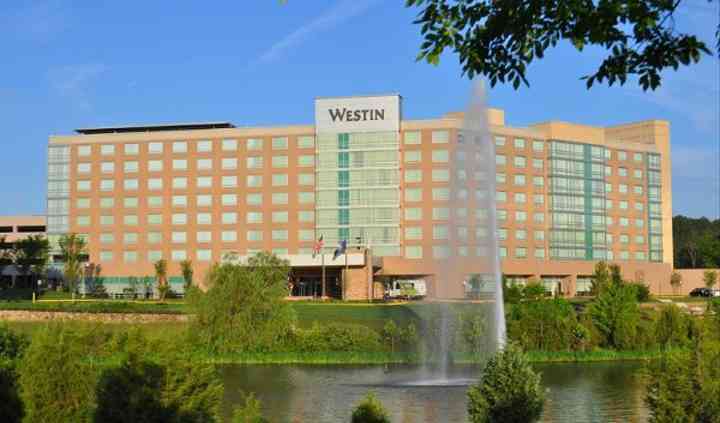 The Westin Washington Dulles is a sophisticated venue located in Herndon, Virginia. For those couples who are using the venue as their destination wedding site, they will be happy to know that they will be a few minutes away from the Dulles International Airport. For easy access to and from the venue, the hotel provides the wedding party with a complimentary shuttle service. Thoughtful touches like this makes each couple's wedding day less stressful and more enjoyable. Surrounded by a sleek and modern style, couples can enjoy the wedding of their dreams and embark on their love story. On your wedding day, you have access to 14,000 square feet of stylish space to use for both your ceremony and reception. 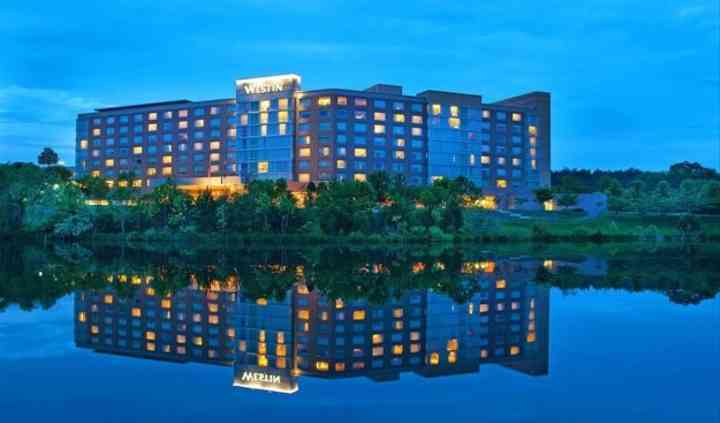 Because the Westin Washington Dulles features this large amount of space, couples are welcome to invite up to 500 of their friends and family. Other wedding events that can be hosted on property include the rehearsal dinner, reception, and post-wedding brunch. At the hotel, you have the option of choosing from an indoor or an uncovered outdoor setting. Regardless of which type you choose, you will be able to enjoy the flexibility that these spaces offer you. The hotel even offers the wedding party an 8,400 square foot ballroom to use. This Rivanna Ballroom features stunning high ceilings and a neutral color palette that is sure to amaze you and your guests. There are also outdoor settings which feature peaceful views of the woods and pond. The hotel contains 314 guestrooms and suites that your wedding party is welcome to use if they need accommodations after the wedding. It was pleasure working with Kristi on our very special day. She was there the whole time and made sure everything was perfect. Thank you very much Kristi to make our day special. Read more It was pleasure working with Kristi on our very special day. She was there the whole time and made sure everything was perfect. Thank you very much Kristi to make our day special. We had our wedding reception at the Westin in October. Honestly I did a lot of planning, but was nervous about how the "day of" coordination would go. I did not have a wedding planner of my own, so I ... Read more only had the coordinator, Erin, from the Westin. Every time I sent her an email, she was extremely responsive, and any time I had a concern, she was able to work with me so that the day would be exactly as I wanted. Everything went so smoothly, I didn't have to coordinate my vendors at all - just gave them some basic instructions and gave them Erin's contact info. When I showed up to my reception, it was exactly what I had hoped for! We held our reception at the Westin, and it was absolutely amazing! Although we had a couple of mix ups, they were fast and responsive to fix them. The hotel itself is gorgeous and made for an amazing ... Read more picture and party location. The chef is incredible, and prepares high quality food! In fact, he even accommodated my gluten and nut allergies and made the entire reception gluten free! We got so many compliments about the food and it was so nice knowing that I didn't have to worry about any food issues. Throughout the evening, the servers constantly checked in on my husband and I and made sure we were well taken care of. The Westin was also so accommodating to my family. They provided an additional suite for my parents for the night of the event and accommodated additional rooms at the wedding rate after the block had officially closed. The only thing I wish was that we had our complimentary champagne and goodies in our suite at the end of the night. The hotel staff seemed a little confused about which room we were staying in, and we didn't have all the luxuries we were supposed to get at the end of the evening. My parents, however, had wine and a cheese platter in their room. Grace Radfar, the director of catering, was delightful to work with! She was quick to answer emails, set up all of our items at the reception, and kept the event running smoothly the entire night! I'm so glad that we went with the Westin for our reception! 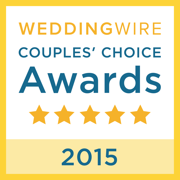 The Westin Washington Dulles is a perfect place to get married. Close to everything in Northern Virginia, and to Dulles Airport, the staff does everything just right. And it is a very beautiful location to have an outdoor wedding in the countryside of Virginia. You are placing yourselves in the hands of professionals, so you won't have a thing to worry about on your big day. 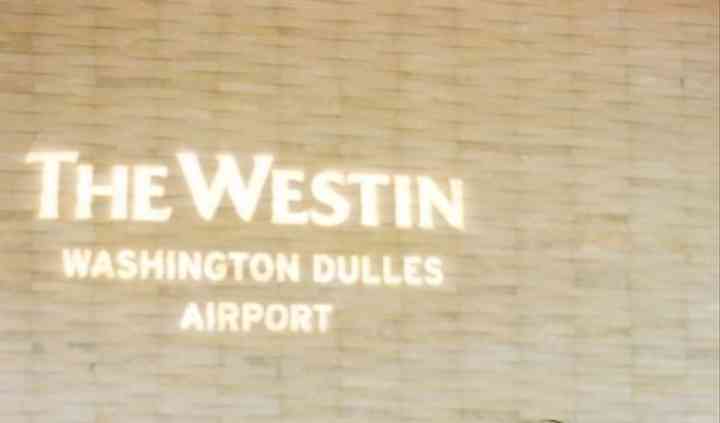 When I get a call to officiate a wedding at the Westin Dulles, I always know it will be a perfect event.